Showing results for tags 'DeAgostini'. Well, I got the first two issues today. Unlike the Victory and such there is no magazine, only the building instructions. There was also a poster of the Vasa. 3 frames, stern decorations, thread and one cannon is what you get in these first two issues. I promised my 10-year old son that he could "help" me build it so I have to wait until he comes home from school before building can start. I will continue later this evening. Hello, olla, ahoy friends and collegues. i think the time just come, that even i create a thread with my work. 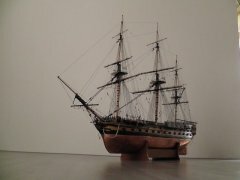 Not that there is much to show, hehe... i am building Hms victory, as title of the thread would also tell you. by no means i build with much of, what you would call skill, its just mere attempt to finish off what i started as a slightly younger enthusiastic modeller with no clue. i have already described my attempts at building this ship elswhere on this great forum. For those who did not catch it, it whas where i described it as a kit for learning (that for learning what i can and cannot do) and that it is sodomised. The latter i still stand for. In the pictures you will see, why i say so. my appologies for the choice of surrounding for the pictures. My and the admiral we live in a small flat and i dont have a dedicated workshop. for those building the same model, i am on issue 69, building and fitting out fore mast. The gallery sits on slightly out of allignement. Nothing i can do now, and i have learned my lesson. Next one will be built a lot better. You can see, i had to use a lot of filler. It does not bother me, first planking job. Because of that, i had to settle for painting, to cover the botched job. Also, i dont think this was entirely my fault, but bow looks different to what it should. I have faired it to the point where all the planks were sitting flat. Maybe i over did it... Main mast was done according to the instruction, which are btw very, very detailed. Just not correct. Very schematic and simplified. Main yard. Instruction called for twisting the wire into coil and attach it to the yard. I hate the way it look and will re do it using just thread. Should i stiffen the thread using ca glue or pva? I tried to imitate the cannon tackles. Looks so bad... good thing is it wont be visible. Those blocks are just way too big for the scale. Also, i have not had bees wax just yet, when i finished the railings, thats why the line looks so not hanging much... I will take any criticism, altough its too late to fix much of it. For encouragement i thank you in advance. next update will be after the finished fore mast fitting out. one question: what kind of primer to use on hull? I know car primer, but which one? Hi, Could you please point out the major differences, maybe some pros and cons of the Santisima Trinidad kits from Occre and DeAgostini? I'm particularly interested in quality of parts and cuts, historical accuracy, planking (single or double), difficulty and your overall score. Thank you very much for taking the time to do this! Hi With the Corel Victory cross section almost completed we ( me and my son ) decided to start on this build. I will bash the kit as and when we come to it. Lots of little things as far as I can see. We started by removing the frames from the laser cut boards. some boards were distorted a little but this is not cause for concern. a very sharp knife was used for this cutting both sides of the board. We then sanded most of the charring from the frames with a nail board. made easy work of the charring. All the frames were offered together and with minimum sanding to make a perfect fit. Then glued the frames together in place over photocopies of the master frame drawing. (7 frames 7 copies). Then all the frames were sanded and excess glue removed then stacked together with a false keel and cocktail sticks to check alignment. They all looked spot on to me Then we built a jig to hold the frames while assembling the keel and the frames. Degostini just used a scrap bit of the laser board as a spacer. Not to my liking as its easy to get a twist in the assembly at this point. What’s not shown is the square that fits on the top to hold everything square. And the Back board made from MDF with a photocopy of the master frame drawing. That’s about it now until next weekend when my son visits. Regards Antony and Karl. DeAgostini Victory problems with parts?